Cascade were a little company, most famous for their “Ace” series on the C64 and other platforms, and infamous for their “Cassette 50” compilation for almost every machine that existed. Cascade in 1988 gained the rights to a popular TV show of the 80’s, titled 19, and were to create the computer game in two parts, releasing part two at a later date. Heavily similar to Konami’s “Combat School”, the released “19 Part One” featured training sections such as obstacle courses, shooting, and new features such as driving rough terrain. 19 Part one was only really successful on the grounds of its excellent Rob Hubbard mix of Paul Hardcastle’s classic tune, and the game bombed in sales. 19 could not really compete with the far superior Combat School, and so it remained to be seen if 19 Part Two could ever make up for the disappointment of part one. Only the odd clip of news was mentioned that part two was being worked on, but no screenshots or any new news ever surfaced, and the game disappeared without trace. Contact with Mark Greenshields has confirmed that the game was in the planning stages, but then Cascade went bust and so the game was never even started. However, rather interestingly, it seems that there were to be two separate games produced for the sequel. With the action game on one side created by the Cascade team, and a second different style of game on the second side… produced externally by Consult Computer Systems by Paul Cole (Who coded Strider on the C64) – see creator speaks for more details. In total, Paul worked on the game for about 3 months before he left the company. Apparently the game got pulled around the same time, and the second version in particular because the game was impossible to program and impractical ideas according to the developer. Sadly Paul no longer has anything of the game, so there is little chance of finding anything unless someone comes forward. So it is just as lost as the main game, which surely must have had 3 months of work started too? Or was the main game in the end just ideas on paper to be based in the war zone? “Game was based upon a hippy writing letters to congress to stop the vietnam war. But the design of it ws too big and too complex, it was suppose to be able to understand letters that were anti-war and score points for them, quite a bit of AI even by today’s standards. With 19, I think the idea was original it was going to be on the opposite side of the cassette version, or second disk, but the game never got finished. I don’t know who worked on the cascade version, as we were a separate development house. 19 part 2 was all part of the promotion for part 1. It was doubtless planned, but after talking to the cascade boss, Nigel Stevens, it never got past the planning stage as far as he recalls. He could see the writing on the wall when he went to visit EA one day and pulled the plug on Cascade (or rather Artronic as they had morphed into) in 1990/1. Interestingly though it seems it was started, at least the second of two parts that were in production. Paul Cole was working on a separate game as part of the pack, though not sure how far the Cascade internal version got. I was looking through an old copy of Zzap! 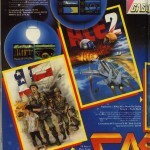 (Xmas 87 issue) and a Cascade advert on page 40 mentions that this game was to be called (19 Part 2 – Viet Nam). Thanks Gaz! Will add the scan and alternate name now!